The gaming industry is seeing a lot of change. The acquisition of Twitch by Amazon, and Mojang by Microsoft come at time when large game studios (and their investors) are worried about the slowing growth of their superstar titles and the uncertainty of success of their new game launches. Twitch and Mojang don’t have much in common. Twitch is a live game video streaming platform, while Minecraft (the game that Mojang is all about) is an open world that players can build and explore - a sort of a virtual Legoland of their own. Minecraft is massively popular. The Pocket Edition, the game’s mobile version, is currently the second most popular paid app on the App Store. In total, Minecraft has had over 50 million downloads - including the desktop versions (15 million), Xbox (12 million), and Pocket (21 million). While Twitch caught wider public imagination (‘is this even a thing?’ ‘really?’) after the news of its acquisition broke, it is huge with tens of millions of monthly active users and growing. A graph of the peak Internet traffic in the U.S earlier this year, put Twitch ahead of Amazon, Valve and Hulu, behind just Netflix, Google and Apple. Their popularity aside, other characteristics of these two companies, now to be part of two large internet conglomerates, could indicate the direction in which gamer and industry interest is shifting. Minecraft gives you many different types of bricks (made of rock and even lava), plants, buckets, swords and many other objects. You then battle monsters who try to block you while you are building and exploring your world. In contrast to the game mechanics of other hugely popular games, there are no time limits which force players to stop or resume gameplay. 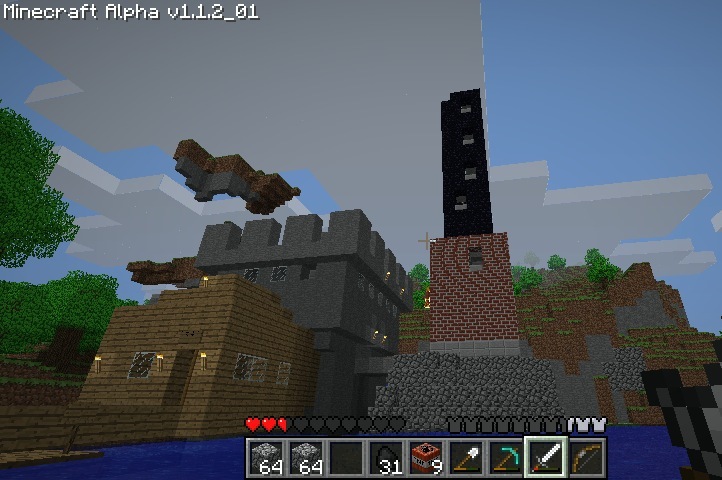 The freewheeling nature of Minecraft lets players stamp their individuality on their worlds. Twitch, on the other hand, is all user generated content. Gaming enthusiasts choose to broadcast or watch. The number of gamers who broadcast is not small, at over a million. Minecraft is known to have an incredibly dedicated community. Its players love building worlds and collaborating through multiplayer mode. Players run their own servers or use a hosting provider, who is usually a player too. Community events on Twitch are a rage, and coveted by advertisers too. ‘Twitch Plays Pokemon’ was a community gaming event earlier this year that had crowdsourced Pokemon gameplay by parsing commands sent by users through a chatroom. It saw over a million people participate, with most simultaneous participation at 121,000, and a total of 55 million views. A majority of Minecraft players are school children and young adults. Building, exploring and collaborating within Minecraft appeals to them. Its players are also often taking their first steps with video gaming. Millions of Twitch stream viewers too are first time gamers. These are the gamers of the future, and are critical to the industry. Minecraft too will benefit from Microsoft’s resources and game server infrastructure, but its creator Markus ‘Notch’ Persson is quitting and the news of its acquisition has led to a large number of fans voicing concerns that Minecraft would lose its indie spirit (more IAPs, anyone?). The next gaming phenomenon might not be built by following a series of steps that have let to successful games in the past, but could instead unexpectedly emerge from its creator’s imagination.